First, a confession. I read the majority of Say Goodbye For Now in one night. That was never my intent, initially, yet I had a really hard time finding just the right place to put it down. Catherine Ryan Hyde has a wonderful way of creating unique characters that you can identify with, the kind who tell a story in such a simplistic way, it’s like becoming part of the scenery. That’s why I couldn’t stop reading. I didn’t want to. Dr. Lucy is content in living alone, far from humans and all the chaos they bring with them. She surrounds herself with animals, the kind who are injured or have nowhere else to go. The kind who would never survive on their own. 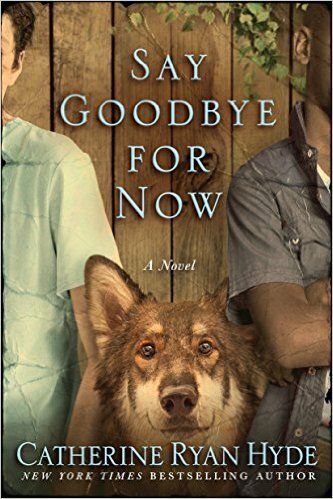 Pete Solomon, a young boy, discovers a wounded wolf-dog on the side of the road, and that’s where his story begins, and where Lucy’s begins, too. Set in rural Texas in 1959, there are a lot of biases and opinions on whether a woman doctor, one who treats humans or animals alike, can do as well of a job as her male counterparts. There’s also a lot of contention when Pete meets Justin, new to the neighborhood, a boy around his age who has similar interests yet those interests differ where the color of their skin contrast. Pete doesn’t understand when his own father threatens his newfound friendship with the new kid in town. He certainly doesn’t understand it when Justin ends up injured and on the brink of death due to his differences. And it’s not safe to take Justin anywhere, injured or otherwise. The only safe place he can go is to Dr. Lucy’s, and when Lucy meets Justin, she also encounters his father, Calvin, a unique man who is different and altogether wonderful. Although this novel is set several decades back from our own time, there is so much that still holds true and relevant to what we encounter today. There are plenty of biases and opinions, many of them stemming from where you come from, your religion, the color of your skin, who you are. 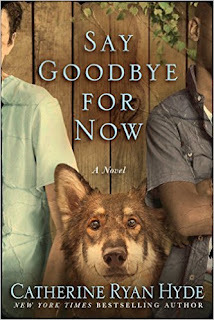 Say Goodbye For Now lays a foundation laced in all of it, giving the reader an in-depth look into what it’s really like to be in the middle of such contention. I love the message this novel relays to its readers. That there is hope. That given time, there can be change. That ultimately, love reigns. And that often, doing what’s right can be the hardest thing you ever have to do, but it’s the only thing worth fighting for. Thanks to TLC Book Tours for the book in exchange for a honest review. They have one copy for a lucky reader! Visit Confessions of a Bookaholic for another chance to win! Giveaway ends December 21st at midnight EST. I would love to say goodbye to debt and my husband's job worries. I would like to say goodbye to my serious health concerns and surgeries. I have chronic migraines. I would love to say goodbye to those! Or at least a few of them!! I would like to say goodbye to Donald Trump and his ideas. I would love to say goodbye to our debt and the stress that goes along with it. I would like to stay goodbye to all the excess in my life. I woukd like to say goodbye to hate, bigotry and racism! I have personally had a very good year. The hatred throughout the world troubles me a great deal though. I would love to say goodbye to my health issues that have just cropped up. This sounds like such a feel-good novel in spite of the heavy topics. And sometimes that is exactly what I want to read. I'd like to say goodbye to bad relationships. To the unhealthy food and lazy life style, I need to start eating healthier and exercise more!